Follow along with Dr. Ananyan on how to use Megaputer’s PolyAnalyst data mining software to analyze insurance claims for evidence of healthcare fraud. 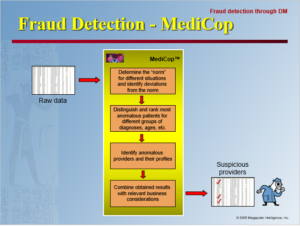 Learn how PolyAnalyst’s MediCop™ algorithm can identify different types of fraud such as billing for services not performed, falsifying diagnoses, upcoding, and unbundling. While conventional fraud can be detected by humans, the amount of data is growing, suggesting a need for software that can assist in the automatic detection of healthcare fraud.